Back pain and neck pain are among the most common and disabling health problems. The interventional pain management physicians at Louisiana Pain Care of Monroe and Ruston can help you regain your freedom of movement so you can live a life free from pain. We offer comprehensive care and state-of-the-art treatments for effective, lasting relief from spinal pain. Most of these treatments are minimally invasive and highly effective, and some are not offered by other area practitioners. A number of injectable products can help alleviate neck and back pain, depending on the location and cause of your pain. Most offer temporary relief but are intended to break the cycle of chronic pain. The extent of pain relief experienced varies based on many factors, including medication type, injection site, the condition being treated, and health of the patient. BOTOX® injections, which relax muscle contractions, have been shown to reduce chronic neck pain, especially when used in conjunction with physical therapy. It can also help alleviate headaches. The effects usually last several months. Epidural steroid injections (ESIs) are used to relieve back and neck pain caused by inflamed spinal nerves due to conditions like spinal disc degeneration, bulging or herniated discs, or spinal stenosis. The injection is made into the epidural space, which surrounds the spinal cord. Effects typically last up to a month. Facet joint blocks, injections delivered at the lumbar (lower back), thoracic (mid and upper back) or cervical (neck) areas of the spine can alleviate pain due to cartilage breakdown of the facet joints. These are the joints that keep your back flexible, guide your motion, and allow you to twist. The effects tend to last a few months. Nerve blocks are injections of a steroid medication into specific areas of the spine with the intent to disrupt pain signals from particular nerves to the brain. Nerve blocks may be performed on peripheral nerves (which control movement and sensation in a particular area of the body) or on select nerve roots. When done on the collection of sympathetic nerves in the neck located on either side of the voice box, it is called a stellate ganglion block. The effects of nerve blocks tend to be short-term and relief is usually measured in hours rather than days. Nerve blocks are commonly used in order to perform a surgery, or for a patient to be able to undergo therapy that otherwise would be too painful to perform. Nerve blocks can also aid diagnosis, helping your physician to pinpoint where the problem is originating by how much relief is experienced by patient undergoing specific nerve block treatments. Sacroiliac joint injections are the injection of steroid medication into the sacroiliac joints located at the bottom of the spine. These joints link the pelvis to the sacrum – the lowest part of the spine, just above the tailbone. Effects may last up to a few months. Trigger point injections (TPI) are used to treat painful, contracted knots of muscles that form when muscles fail to relax. These areas can usually be felt under the skin. The injection is made directly into the knotted muscle, which is also referred to as the trigger point. Effects vary significantly, but tend to last a few weeks. The pain management physicians at Louisiana Pain Care offer medication management for patients suffering from neck and back pain. 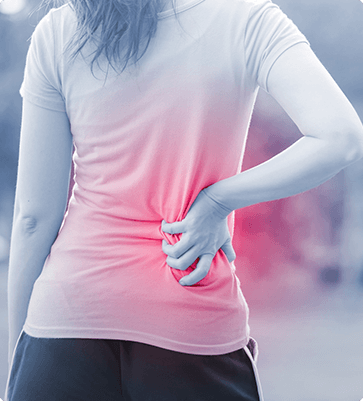 There are a wide variety of drugs to treat this type of pain – from over-the-counter nonsteroidal anti-inflammatory drugs (NSAIDs) like ibuprofen and naproxen, to prescription-strength pain relievers. The medications recommended will depend on your medical condition(s), health, and history. In this pain-management approach, radio waves are used to heat and destroy an area of the nerves believed to be causing pain. The image-guided procedure uses special needles to apply electrical signals that heat the nerve to prevent it from carrying pain signals to the brain. Radiofrequency lesioning, or ablation, is most commonly used on peripheral nerves, facet joint nerves, and sacroiliac joint nerves. Pain relief can last for up to a year or longer. At Louisiana Pain Care, our physicians use HF10 spinal cord stimulation to safely and effectively treat back and leg pain. It involves implanting a device along the spine, which will deliver electrical impulses to the spinal cord, disrupting pain signals to the brain. The procedure is reversible and can help reduce or eliminate a patient’s need for pain medications. Both these procedures – vertebroplasty and kyphoplasty – are minimally invasive procedures that fill vertebral compression fractures with an injection of surgical bone cement. In a vertebroplasty, the cement simply fills the fracture. In a kyphoplasty, a balloon catheter is guided to the vertebra where it creates a cavity that is then filled with cement, while restoring the height of the vertebra. Tired of dealing with crushing back or neck pain? Don’t put it off any longer – call the interventional pain management specialists at Louisiana Pain Care in Monroe or Ruston at (318) 323-6405 today or use our online form to make an appointment.